I hate that my last Facebook cover was created by Tom Bricker, that my current was created by Tom Bricker, and that the next will be created by Tom Bricker! I hate that my best pins on Pinterest have Tom Bricker’s name behind them! I hate that unlike creatives like Designerland and Bricker I lack an eye for creating artistic pieces and I am stuck appreciating the work of others instead of truly creating. Yes Tom Bricker, you are on my list! Bricker in Disneyland: Sunrise to Sunrise provides readers with a glimpse into the 2012 “One More Disney Day” held on Leap Day. He provides over 200 pictures taken in the park during this one single day, be it a long day even for Disneyland. The pictures are organized not by themes like the hour of the day or land in which the shot was taken, but around which shots are pleasing together. Some pages consist of single pictures which generally are ones that instantly transport you into the park. Along with his pictures, Bricker provides commentary on the shots including location, perhaps time of day, or historical tidbits about the subject of his picture. As much as I hate Bricker and his creativity, these pictures are fantastic. He provides shots that will take you back to the park no matter where you read the book in Betweenland. And they are photos you will want to share with others, after my first read the Between Family all sat down to scroll through the book which lead to conversations about our own Disney Parks memories. There are photographic subjects which reoccur throughout the book. For example, one may say that multiple shots of Sleeping Beauty Castle are going to get old fast, instead I found that each shot of the castle though centered on the same subject brought a unique look at the Disneyland “Wienie” and honestly never got old. And every Disney fan would be happy to have many of these shots as framed prints on their walls, perhaps claiming they personally took them. Maybe I really don’t hate Tom Bricker after all! Maybe I am actually a fan! If I could make any special requests, I would have loved a shot of the Firehouse at night, with Walt’s lamp glowing and a shot of the plaque from the Main Street U.S.A. entry arch. Of course, that’s because taking those shots are part of my traditions and would love really well composed shots of each. Honestly, my pictures of both are pretty touristy. 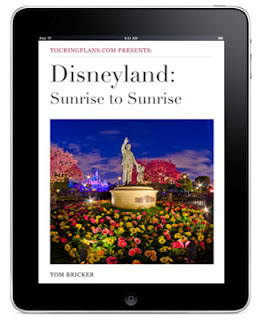 Disneyland: Sunrise to Sunrise is an eBook which you can buy direct from Touring Plans. And it did cause me minor issues, I tend to be a physical book guy and not an eBook reader. So I did struggle to get it into my eReader, struggles that ended the moment I had my “duh” moment and easily pulled the file into iTunes. Trust me, if I can do it so can you. I found that I preferred reading the book horizontally and not vertically, which on my reader gave the pictures and text better scale onto the screen. Additionally, I found I really enjoyed skimming through the book on my home computer, which gave the pictures the maximum space needed to live. For me in Betweenland, it was never an option to attend “One More Disney Day.” Instead I do feel like I had an opportunity to participate, following other Disney enthusiasts like Tom Bricker on Twitter and bugging a friend who is Disney Adjacent and went to the park after work. Personally I am thrilled for the opportunity to have a photographic souvenir from that one very long operational day in an affordable and mobile package. Mr. Bricker maybe we can reconcile if you put a nighttime picture of the firehouse on Pintrest. It would go a long way towards apologizing for reminding me how poorly my photos look. Betweenlanders want to know more about Disney, we want the inside track on rumors and what could have been. Let’s face it, living in Betweenland you are kinda out of the Disney loop. Sure we can hear rumors and get news from the main Disney news outlets, but we want to know more than Cars Land is going to open June 15, 2012. We want to know about the things that could have been, the things that never happened and the inside stories of how our favorite attractions were developed or became extinct. Jim Hill lives that dream. He knows people and has connections within Disney and the theme park industry that most Disney enthusiasts will never have access to. Sometimes it is about who you know! Additionally, it seems clear that sometimes Mr. Hill has lucked into seeing pieces of Disney history that many would not have noticed, but when seen through Mr. Hill’s eyes tell a story of what will or was to be. Len Testa, of WDW Today and Touring Plans, has partnered with Jim Hill to create “The Unofficial Guide’s Disney Dish with Jim Hill.” The podcast is simple in production but rich in content. The two Disney experts literally walk around the parks talking. Testa throws out questions to which Hill responds and provides stories and details that often have not been heard before by Disney fans. As they talk you hear the sounds of the background music and running attractions around them. In the first seven episodes they have toured all four parks of the Walt Disney World Resort; The Magic Kingdom Park, Epcot, Disney’s Hollywood Studios, and Disney’s Animal Kingdom. Additionally the two have walked through the hotels of both the Epcot area and Magic Kingdom. They have even toured Downtown Disney. The content of all these podcasts is fascinating. I have repeated so many of these stories to the Between Wife, she would probably like me to quit listening. The story telling is engaging and often funny. And both Hill and Testa know these theme parks in a way many of us could only dream of. Every episode is an absolute must listen. And when they are done, you feel like you know something new and something the off the street Disney fan is not in the loop about yet. The biggest question I have is the future. The podcast releases on a very irregular schedule, with every release being a surprise that instantly goes to the top of my listening queue. So every episode leaves the listener with the question of when will another episode drop and what will it be about. I can foresee episodes on Blizzard Beach and Typhoon Lagoon. And there could be more episodes on hotels, it’s not like they have visited the values yet! Perhaps, one way to keep this series going is more visits to the visited parks, especially after the completion of the New Fantasyland. Another idea would be a visit to Disneyland for three or four episodes. Yet another opportunity is clear in their episodes on the Universal Orlando Resort, which introduced this park to me a non-Universal fan. As much as I don't want to admit it, Orlando offers more than one resort. Most recently they have released episodes with Sam Gennawey with Testa, sharing his planning knowledge about design elements within the Magic Kingdom. Clearly there is still opportunity to share some great stories. And I will be waiting out here in Betweenland to put myself in the loop. Yes, a Computer Animated Hand! This short video from 1972 is referenced in The Pixar Touch. Compared to a big screen Pixar production, or even Pixar's earliest shorts this video is simple. And it does not impress our 21st Century tastes. But this production by Pixar founder Ed Catmull was a landmark moment in computer generated animation. The segment was later reused in the 1973 movie Westworld. And it was included in the U.S. Film Archive for preservation due its historical significance. Yes, a Computer Animated Hand! And one more step towards Toy Story! 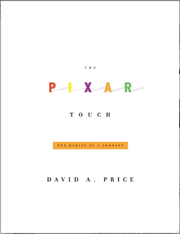 David Price in The Pixar Touch: The Making of a Company details the origins, struggles, and successes of Pixar Animation Studios until its 2006 purchase by the Walt Disney Company. Price begins his story with college student Ed Catmull who wanted to be an animator but determined that he had limited drawing talent. The highly intelligent Catmull instead threw himself into computers and became determined to use computers to create animation. In 1972, he created a graduate film in which he animated his hand. The video was both simple and revolutionary in showing the potential available in computer animation. Catmull became recognized as a leader in computer graphics and professionally tied himself to like minded Alvy Ray Smith in the quest to improve computer animation with a shared goal of an animated feature. Eventually Catmull and Smith found themselves drawn to Lucasfilm, working on computer systems and graphics for the George Lucas’ production company. While at Lucasfilm, Catmull and Smith recruited a third revolutionary figure, former Disney animator John Lasseter who provided the animation skill needed to create convincing character animation. Catmull, Smith and Lasseter hid their efforts to achieve their common goal of an animated feature with Lucasfilm, who chose to sell Catmull’s computer unit off or shut down their operation. They reached out to former Apple executive Steve Jobs who was attracted to the hardware potential in his new acquisition. Still Catmull lead his team with the goal of animation, despite Jobs’ apprehension. After years of being a financial lose, Jobs’ incorporated Pixar Animated Studios found enough success with commercials and short films to partner with Disney to complete and distribute an animated feature, Toy Story, which filled with character and innovative animation began an instant hit and classic film. Price then outlines the problems in the Pixar-Disney relationship including friction between Jobs and Disney CEO Michael Eisner which was leading to an eventual end to their partnership. Instead of a lasting schism, new Disney leadership under Bob Iger led to the Disney acquisition of Pixar Animation Studios. This purchase lead to Lasseter becoming Disney’s and Pixar’s Chief Creative Officer, including Walt Disney Imagineering, and Catmull being named President of Walt Disney Animation Studios, along with Pixar. The disgraced Disney animator and the boy who could not draw had become the guiding forces behind the world’s most prestigious animation organization. Price does an excellent job of presenting the details of a complex story. He makes it clear that the leadership of Pixar were always united around a common vision, making an animated movie. While others may have seen them as computer hardware or software group, the Pixar leaders regardless of their company name, were always dedicated to a common cause. With their vision not aligned to their owners at times, leaders like Catmull had to make hard decisions or be partially dishonest to do things like add John Lasseter to the payroll. And Price makes to clear how that vision was shared with others, with Lasseter at one point rejecting a return to Disney in order to make history in the Pixar ranks. I was also shocked how my opinions of some within the Pixar story changed. I had pictured Jobs as a benevolent leader who guarded the Pixar staff from economic forces with his own personal fortune so they could evolve towards making an animated feature. Price instead gives us a picture of Jobs who is at times more adversary than benefactor, with figures like Catmull protecting the Pixar staff and at times unsuccessfully. Additionally, Price shows that Jobs was a late comer to the dream of an animated film. And I found my already high opinion of Catmull being further extended as one realizes the opportunities he turned down for short gain that resulted in his and Pixar’s success in achieving their dream. The Pixar Touch is well written and engaging. It is not a fictional thriller, but a straight forward and highly accessible read. It may be considered a business book, but it is one that any Pixar or animation fan can read and enjoy. Price takes the time to explain highly technical points, especially around software and hardware, that those not in the information technology realm would not readily know. And he does a good job explaining these to the common man. The book clearly demonstrates the power of vision to technical and business leaders. Additionally, it is well researched based on interviews and primary and secondary sources. The Pixar Touch is an engaging and educational book. It shows how the power of vision and the determination to follow it through can make something clearly amazing. It is a must read for animation fans, those interested in the history of computing, and Disney enthusiasts. Those wishing to explore the history of Pixar should begin with The Pixar Touch. Since 1967 with the opening of Pirates of the Caribbean at Disneyland, Disney fans have been suckers for Pirates. The addition of the Pirates of the Caribbean movie franchise has both reinforced this tendency but also brought pirates into the public eye and pop culture. 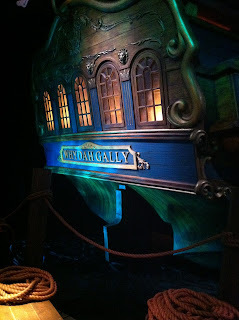 Being Disney fans, when the Between Family saw that The Science Museum of Minnesota was hosting Real Pirates: The Untold Story of the Whydah from Slave Ship to Pirate Ship sponsored by National Geographic, it was a no brainer that we would be attending. Of course attendance in this family means with tricorn hats and spyglasses for the kids. My first word of warning is this traveling exhibit is somewhat pricey. For those looking to take in Real Pirates at The Science Museum of Minnesota, the cost can easily be $36 per adult on the weekend. 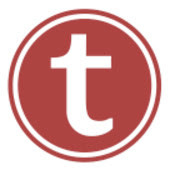 I recommend seeking out discounts, determining if an annual pass (much like the Disney parks) may provide a discount, or touring during times when the price may be decreased like the weekdays. As we Disney fans know, time and money are likely two of your most valuable commodities when looking to make family memories. At The Science Museum of Minnesota guests are provided a timed entry ticket to the Real Pirates exhibit. Guests enter from the queue as a group into a small movie viewing room that provides background information about piracy, the pirate ship Whydah, and the discovery of the sunken ship off the New England coast. At the conclusion of the film the screen rises to unveil the original bell from the Whydah carefully preserved in a water tank. I hope this revelation does not spoil your visit, but the sight itself is remarkable and puts the audience in a nautical state of mind as you begin to wander the exhibit. Guests then walk through an exhibit that starts with a history of the African slave trade including artifacts. The oldest Between Kid was especially struck with the fact that items on display were used to hold people in forced captivity. The heaviness of it hit the Kid right between the eyes. For something that the kids thought was only going to be fun, I think the lesson about treating each other humanly was unexpected. The exhibit then leads guests through the story of how Captain Sam Bellamy of the Whydah chose to make his fortune as a pirate and grew his reputation as a pirate captain. The exhibit shows a number of recovered items from the Whydah including cannons. As part of the exhibit an actor portrays Bellamy, who to the pride of any Disney fan stays convincingly in character. Bellamy discusses the use of cannons on the Whydah including his strategy for defeating another ship. Later in the exhibit is a walk through replica of the Whydah showing life aboard the pirate ship. Before stepping onto the ship with their right foot, infamous pirate Blackbeard spoke with the Between Kids about pieces of 8 and making change in the pirate world. Again, the actor never left character and the Between Kids gave the pirate full attention. Like Pirates of the Caribbean, I thought the exhibit was over with the treasure room. 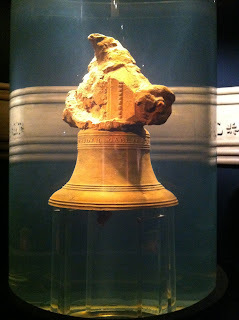 The exhibit displays the only recovered pirate treasure in a room filled with pieces of silver and gold. This includes a chest full of Spanish pieces of eight. I could imagine Jack Sparrow sitting in the middle of the chest counting his treasure. After leaving the room, guests are providing information on the final fates of members of the Whydah crew including Captain Bellamy and kid pirate John King. The exhibit also tells guests of the end of piracy. And as I walked past these final plaques I thought it was time for the Between Family to run out into the rest of the museum. But I was wrong, and we still had a figurative waterfall to climb. I was quite impressed that the final room was actually a display of recovered artifacts. The exhibit showed actual water protected recovered blobs of artifacts. The display showed how these collections of metal are preserved, identified and recovered. It was a piece of working history that I did not expect to see in this exhibit. As part of the exhibit each guest was provided a free audio guided tour. 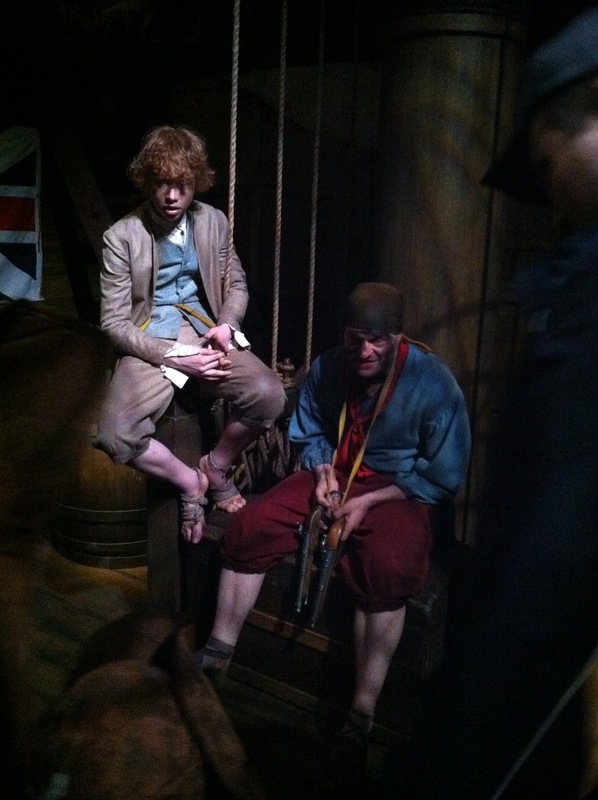 The tour included narration from actors portraying Whydah crewmen and helped provide a flavor of what being a pirate is, along with education. Walt Disney would have probably signed off on this form of Edutainment. Out here Between Disney you find connections to your Disney experience and make the most of it. In the end, others may have found it odd that the Between Kids were wearing pirate hats but honestly we entered this educational experiment with a sense of fun. All in all every member of the family learned from and enjoyed this exhibit. We may not look at Pirates of the Caribbean completely the same again, filled with facts of real piracy. If it’s in your budget and near you out here Between Disney, Real Pirates may be a fun way to spend an afternoon. I’ve been really critical of Disney sci-fi properties. I will continue to argue that if Tron and not John Carter serves as the Disney sci-fi standard, Houston we have a problem! I wanted to find a Disney film that helped me show that John Carter was part of a tradition of some decent Disney sci-fi and was not just an aberration. Searching the corners of my mind I remembered many a weekend afternoon as a child where with 4 channels and no VCR it was Read a Long Story records that replayed The Empire Strikes Back, Raiders of the Lost Ark and other classic stories in my mind. 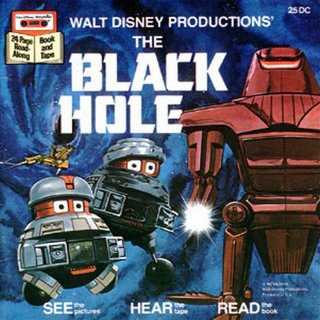 And one of those worn out records was a Disney movie, 1979’s The Black Hole. · Disney Legend: Peter Ellenshaw was named a Disney Legend in 2003. 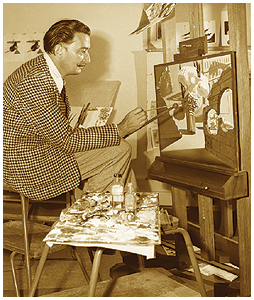 Ellenshaw served as a matte artist for numerous Disney films. A few you may have heard of include Treasure Island, 20,000 Leagues Under the Sea, Old Yeller, Johnny Tremain, and Swiss Family Robinson. He went onto special effects in other Disney movies including The Love Bug and this little picture you might not know a lot about called Mary Poppins! Basically Ellenshaw built a career on the Disney live action Parthenon. For The Black Hole, Ellenshaw created the miniature effects which make us believe that we are in space and not a studio. For his efforts, the movie was nominated for an special effects Academy Award. The effects for being over thirty years old really are good. They may not of the Industrial Lights and Magic quality but they are believable, and you are sure you are looking at real objects and not animated effects. · Freaky Friday: Director Gary Nelson may have seemed like an odd choice to helm The Black Hole. I do have to admit with credits including Get Smart, Gilligan’s Island, Gunsmoke and The Andy Griffith Show; Nelson did bring experience to the film. And he had directed 3 films before The Black Hole, all for Disney. So maybe it wasn’t his experience directing sci-fi epics that got him the job, and instead the fact he was a known Disney director after leading Jodi Foster through the original Freaky Friday. · The Final Frontier: Disney seems to think that humans need some living space. In The Black Hole Captain Dan Holland’s (Forester) on the USS Palomino is exploring space for worlds to open up for humanity’s use. If you want to explore this concept yourself, I suggest riding Mission Space at Epcot, so you can simulate a visit to Mars. Sadly, no black holes though the location of the landing strip next to a giant canyon still seems odd. · Is that you Captain Nemo? : Is this movie The Black Hole or 20,000 Leagues Under the Sea? 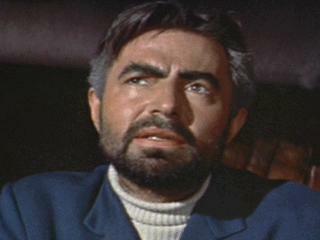 You can’t help but compare Schell’s Dr. Hans Reinhardt to Captain Nemo. Both have vast intellects who find it difficult to be understood by mere men. Both live solitary lives on vessels; one in space and one in the sea. Both are surrounded by a crew whose loyalty is unquestionable. And most of all both have fantastic beards! 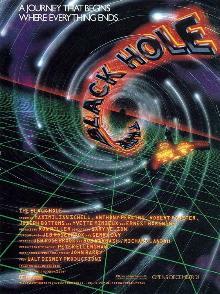 · The Son-in-Law: The Black Hole was produced by Ron Miller, which actually links The Black Hole to Walt Disney himself. The former football player married Diane Disney in 1954 and was convinced by his father-in-law Walt Disney to enter the family business, film making. Miller produced a number of films before becoming the President of Walt Disney Production in 1980 and CEO in 1983. Miller left the company in 1984 in the upheaval that saw him ousted and Michael Eisner and Frank Wells joining the company. Not looking behind him, Miller has thrown himself into the Silverado Winery and supported the development of the Walt Disney Family Museum. And according to some Mousetalgia hosts, he is still a very handsome man to this day. The Black Hole really does hold up over time. It is well acted, has a good story and decent effects. I do not understand how this is not a Disney cult classic. It is a movie sci-fi fans, families and Disney enthusiasts can all enjoy. It is Mousey through and through and maybe someday the rumors of a remake that surface every few years will come true. 1941 was not a pleasant year for Walt Disney. World War II had closed European markets to Disney films leading to significant lose of revenue. And the family-like dynamic of the Walt Disney Studio changed as the animators went on strike and unionized. The Walt Disney Studio truly became a business. These events were very stressful for Walt Disney. Luckily for him, he was asked to complete a good will tour of South America on behalf of the United States Department of State to support the Good Neighbor policy, showing the U.S.’s Latin American neighbors that the United States was a friendly regional ally in the face of a global war. Walt Disney agreed to go on this South American adventure; leading a group of 18 animators, writers, composers and wife Lillian Disney. Disney agreed to use the trip to gather story material for future Disney films, films which the U.S. government would underwrite guaranteeing that Disney could keep key staff employed while not facing a financial loss for the projects. The films inspired by this trip included Saludos Amigos and The Three Caballeros. The documentary Walt & El Grupo tells the story of Walt Disney’s South American adventure. The story is told through film taken by members of El Grupo and those they interacted with, letters sent by the travelers to family members, and interviews with colleagues. The film shows not only the Disney team experience, but also interviews South American citizens who spent time with the Disney party. Walt & El Grupo gives us a window into a difficult period for the Walt Disney Studios, Walt Disney and a world enflamed by global war. · The documentary includes portions of interviews with legendary Imagineers such as Harriet Burns and Blaine Gibson who worked with members of El Grupo and their reminiscences are delights as they recount the events of 1941. · There are a number of Disney legends who were part of El Grupo that will catch the attention of Disney fans. For example the art work of Mary Blair is well known to even to the youngest of Disney fans thanks to it’s a small world. However the documentary’s profile of Blair provides us a glimpse of Blair the artist, woman and dynamic force. Likewise, Herb Ryman is well known to many for drawing the original Disneyland concept map and this documentary lets fans see Ryman over a decade before Disney’s theme park project. · Thanks to the interviews with those that met Disney and his band we get a glimpse of how Disney impacted the peoples he visited, leaving lasting memories that many individuals and even groups cherish to this day. It is really enlightening to see how the visit to South America impacted the children of those Disney met, some of those interviewed were not even born at the time of Disney’s visit. You are given the impression that compared to other celebrities the fact that Disney attempted to meet individuals and learn about foreign cultures is respected to this day. · The documentary also shows us also how cultures outside of North America view Walt Disney today. And like some Americans you may interact with it is still often the myths of Walt Disney and not the realities of the man that continue to spread throughout culture. · This was a very difficult time in the life of Walt Disney, yet much of the film taken for this trip is a happy, smiling, laughing Walt Disney. We see a picture of a man who loved life and loved to explore the new. As he learns a new dance, you see the joy in his eyes as he learns something completely new. · Additionally, part of the Disney’s frustration during this time was the loss of a sense of family at the studio. When he returned the strike would be settled by the atmosphere would never be the same again. Yet in the film recorded in this trip it becomes clear that Disney and his associates did have a close relationship, and the letters sent to family members make it clear that many in the group did not wish to return to a very different Walt Disney Studios. The fun of making animated movies was dying for Walt Disney and his staff. 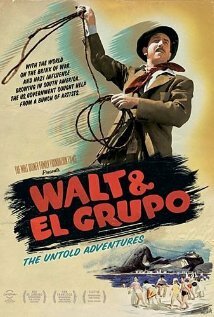 Walt & El Grupo takes us back to 1941, before Walt Disney built theme parks and had not even made a live action movie. It also shows a transition in both Disney’s company as the studio became less of a club and more of a company. And it shows a transition in Disney’s preferences as he began to lose interest in animated features due to that changing environment. The documentary has a delightful soundtrack, a good balance between original black and white film clips and color segments recorded years after. And the documentary has a star, Walt Disney himself! Personally, I do not find it as engaging as Waking Sleeping Beauty, but it is well worth the watch for a die hard Disney fan. 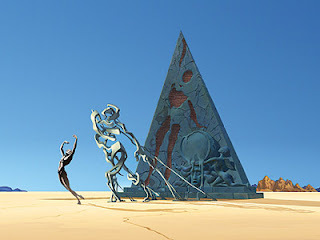 One of the topics discussed in Jim Korkis' The Vault of Walt is the short film "Destino". This film was a collaboration between Walt Disney and famed artist Salvador Dali which began in the 1940s and was not completed until 2003 by Walt's nephew Roy E. Disney. That is the most interesting baseball game I have ever seen! What did you think of "Destino"? 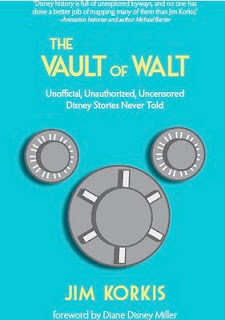 The Vault of Walt: Unofficial, Unauthorized, Uncensored Disney Stories Never Told collects writings of popular Disney historian Jim Korkis. The writings found within the book range from the life of Walt Disney to the lives that Walt Disney impacted. 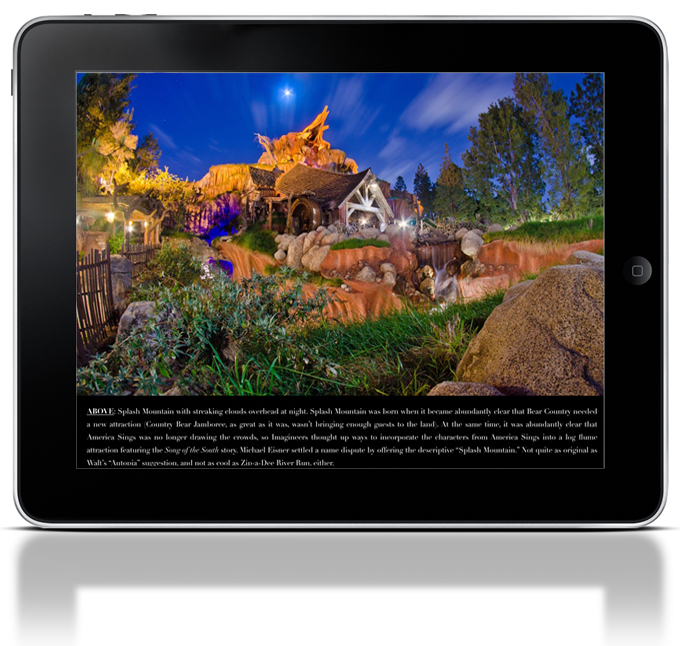 The book is broken into four sections; “The Walt Stories,” “Disney Film Stories,” “Disney Park Stories,” and “The Other Worlds of Disney Stories.” Each chapter is really a self contained story of around 10 pages that are combined into themes but do not build onto each other. Stories found in this 400 plus page book range from the faith of Walt Disney, movie premieres such as Snow White and Song of the South, the development of the short "Destino" with Salvador Dali, the production of Captain EO and so many many more. Here at Between Disney we are always honest and I had prejudged The Vault of Walt early. First, after reading three other Ayefour titles; Project Future, Four Decades of Magic, and Walt and the Promise of Progress City, I was convinced that the streak for fantastic books had to end someday, you know like Pixar’s winning streak which will end someday. Second, when I read that the book consisted of repurposed blog posts I knew my judgment was confirmed. 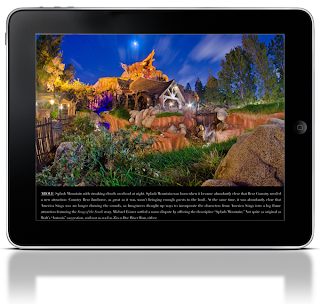 I love Jim Korkis when he presents stories in an oral format like on podcasts like WDW Radio. But often, for me, Korkis’ blog posts fall short. That’s kind of ironic isn’t it! Shame, shame on me! The Vault of Walt is a wonderful, entertaining, educating and overall delight. I took three weeks to read this book. Was it because it was poorly written or difficult to work through? No it was because these tales deserve to be savored, they should not be rushed through for the sole purpose of saying you have read another book. No The Vault of Walt is a fine meal that should be chewed and enjoyed, not rushed. This book is excellent and should be on the shelves of every Disney library. When I say a wide range of topics, I mean it. The Vault of Walt is incredibly diverse. Topics include obscure Disney topics that I have never read essays on in other books such as Walt Disney and his relationship with DeMolay. Personally I love the detail in the essay on Walt and Roy O. Disney’s return to Marceline, Missouri and their reactions to their boyhood home. And the chapter on two key women in Disney’s life gives us a new and in-depth view of Walt Disney the employer. The chapter on "Destino" led me to seek it out, and wow all I can say is that’s the most interesting use of baseball imaginary I have ever seen. The chapters are informative but also leave you wanting to seek out more. Honestly, almost every chapter in The Vault of Walt was a hit for me. I read this book for the stories and I discovered a resource for researching somewhat obscure Disney topics. Congratulations to Jim Korkis in helping prove that Ayefour titles are all ones that the literate Disney fan needs! · Laugh-o-Gram: I underestimated how funny this movie was going to be. Quick quips, puns, and fun dialogue are traditional comic book tools. And we have seen some humor in the past films. But in The Avengers the fun lines are ramped. I really should have expected this because Joss Whedon wrote the story and screenplay. Overall my experience with his work is limited. But the one franchise of his that I love is Firefly which shares this type of witty dialogue. I quote Firefly lines all the time! I cannot really tell you all of the lines that clicked with the audience because I missed some payoffs because everyone was drowning out the audio laughing. I do think Whedon gave the best lines to Robert Downey Jr. as Tony Stark/Iron Man who continues to shine in this role. · Agent of S.H.I.E.L.D. 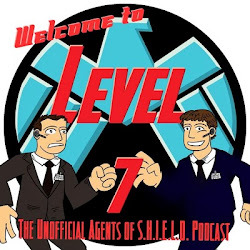 : We have been introduced over the years to agents of S.H.I.E.L.D. including Nick Fury, Phil Coulson, Black Widow and Clint Barton/Hawkeye. These agents have also been support but never the stars. In a film with heavy hitters like Iron Man, Thor, Captain America and Hulk the characters that get the most development are these agents along with the newest member of S.H.I.E.L.D. Maria Hill. With the big guys we have seen them developed in their own films, so it honestly fells like these are the characters who should be built out further. Honestly, these are the characters you will probably look forward to the most in the future. · Reality Check: So villain wise this is probably the most ambitious of the non-human villains to date, therefore a ton more of CGI. Yet I still felt like these alien invaders fit within our world and were believable. I think an element that works to help establish reality are heroes with basic earthly weapons. Having Black Widow and Hawkeye with guns and bows sprinkled throughout scenes with CGI villains and heroes helps to ground the image in our world. · Fearless: The Avengers breaks the expected conventions. So be prepared for a ride. In The Incredibles we get an education on some of these clichés, like monologuing for example. In The Avengers the story breaks these clichés. Characters do the things that you would want to do in the real world. If this was a horror movie, somebody on the screen would say “hey don’t be foolish and walk into the woods unless you want to die first.” And the story takes risks. I had done a really good job avoiding spoilers and I am glad I did because within the first 15 minutes something I had not expected had happened and changed what I thought of the story rolling out in front of me. 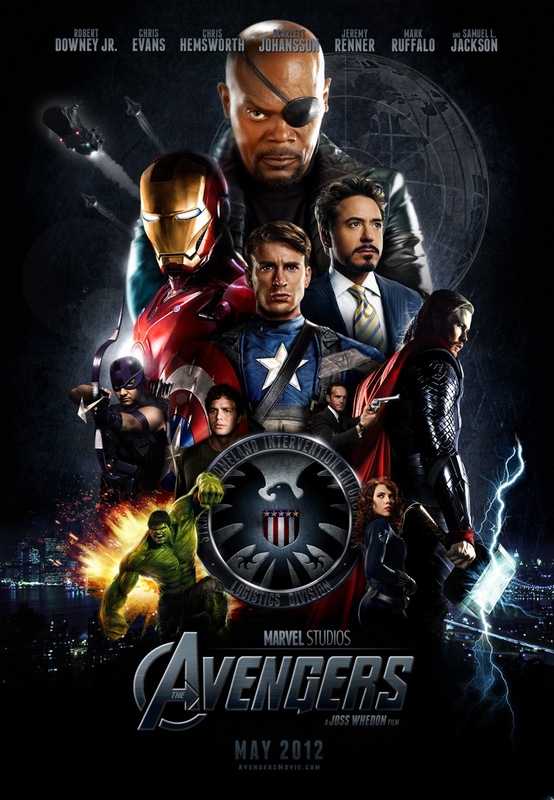 As a side note, The Avengers is not really a Mousey Movie except for links to the other films in the Marvel Cinematic Universe. But I will not be pointing fingers. There is a lot happening in this film and I would not ask for them to force in hidden Mickeys just to impress a Disney fan! No, I will take The Avengers as it is a popular and growing Disney franchise that we will love for years to come. I am sure many of you will be assembling with your fellow avengers at a theater near you, maybe even for a second or third time. I do have standards and despite what you may think I do not declare every movie is Mousey. First, I need to find a minimum of four hooks that tie into the Disney legacy. So when I rewatched The Incredible Hulk, I could not find those four hooks and I declared it not Mousey. Other movies that I have simply not enjoyed I refuse to declare Mousey out of spite. For example I will not call Gnomeo and Juliet Mousey, despite the role of Elton John and a Kermit t-shirt on a clothesline because I did not enjoy it. I do have standards! Despite that I really want Captain America: The First Avenger to be Mousey. It is the last offering from the Marvel Cinematic Universe before The Avengers with the post-credit scene likely running straight into the 2012 blockbuster. · Driven to Serve: Puny Steve Rogers is driven to serve. He wants to do his fair share in the war effort against the Axis powers in World War II. But he is disqualified over and over again because he is too sickly, too small, too weak. In order to overcome these obstacles he agrees to become a super solider, undergoing a treatment that gives him strength and speed. He uses these super abilities as Captain America to thwart Germany’s foremost scientific organization, Hydra, and its leader the Red Skull. There is a real life parallel with Walt Disney. During World War I, Disney also wanted to serve and do his fair share in the war in Europe. His older brother Roy O. Disney was serving in the Navy and Walt thought he should be carrying part of the burden of the war effort. At age 16 he dropped out of school and tried to join the Army. He was rejected for being too young. But like Rogers, Disney found a way to overcome his obstacles to service. He joined the Red Cross and drove an ambulance in France. Unlike Rogers, Disney’s service was all in peace time. He did not begin his year in the Red Cross until after the November 11, 1918, armistice. 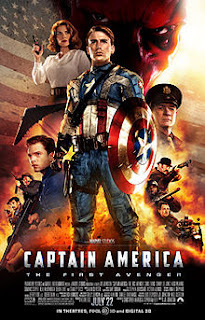 · Are You Mad: Sebastian Stan plays Steve Rogers best friend and companion in arms Sergeant James Bucky Barnes. Barnes prepared for his role by studying hours of World War II films and documentaries. This leads me to ask, how does one prepare to be the Mad Hatter Stan steals an entire episode of ABC’s Once Upon a Time as this iconic Disney character. It is nice to be reminded that some worlds, including ours, need magic! · Rockets Away: Director Joe Johnston clearly knows two things. First, he has been successful with films set during World War II. Second, he has a proven track record with using fantastic scientific devices as a plot device. Third, what wait three, he knows how to direct his bad guys as German baddies. Johnston not only was successful with this formula in Captain America: The First Avenger but also in the cult classic The Rocketeer. · Ohana: The movie is scored by prolific composer Alan Silvestri. Silverstri’s past Disney credits include but are not limited to Lilo and Stitch, Flight of the Navigator, and The Parent Trap (Lindsey Lohan version). Silvestri was nominated for a Grammy for a Disney offering, 1988’s Who Framed Roger Rabbit. Well, did I pull it off? Do you agree this is a Mousey Movie? It sure does smell like it to me! Take that Potter Pal, you have been defeated. And good will carry the day as we await the release of Disney and Marvel’s The Avengers.